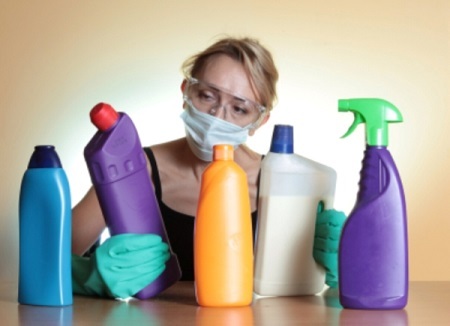 Nitrogen, ammonia, phosphorus and other chemicals used in making conventional cleaning products are grouped under the term “Volatile Organic Compounds” – VOC by The U.S. Environmental Protection Agency as the environmental hazards in conventional cleaners. VOCs can cause a number of health hazards by when used indoors. When used, it concentrates inside the household air and goes outdoor, thanks to proper ventilation. VOCs contribute to smog and other environmental pollution that is dangerous to wildlife. Many conventional cleaning products contain phosphates, which has a negative effect on the ocean. In smaller bodies of water, phosphates can deplete the supply of oxygen in the water, increase the growth of algae, and creates other harmful living conditions for wildlife. Harmful toxins from chemical cleaners are discharged directly into the environment and will possibly find its way into water bodies without being treated, causing havoc to animals. Nitrogen, ammonia, and phosphorus are all fertilizers used by farmers to help grow plants in controlled environments. However, these same chemicals enter and pollute a freshwater environment as residues of household cleaning which were left uncontrolled or untreated. These lead to increase the life cycle of the plants chemically, leading to massive death, decay and depleting the oxygen in the water. It destroys freshwater fish and other wildlife and their death cause more decay as well. With time, the water will not be suitable for drinking or bathing by humans and other animals. The good news is this can be controlled! In order to stop using conventional cleaning products that are harmful to humans and other living creatures, you would have to switch to green cleaning. There are natural and organic products that are becoming more popular and affordable these days. You can even opt for the use of green cleaning products when obtaining professional cleaning quotes; it’s more friendly to you and the environment! Clearly, there are environmental benefits to using green products and methods of cleaning. They are non-toxic and less harmful to the water bodies and they tend to break down more effectively. More so, green products release fewer toxins into the air, which is a major contributor to poor air quality. They are solvent free and have almost no odor at all, creating room for fresher air. Vinegar is a naturally biodegradable green product that has its cleaning uses. It is one of my favorite when it comes to green cleaning, and I highly recommend it if you want to have a safer environment. Baking soda works well with vinegar to clear clogged drains. Mixing baking soda with a cup of vinegar in hot water can be very effective in clearing drains. NOTE: By disposing of your conventional cleaning products and other hazardous cleaning chemicals, you might assist the ecosystem and your own health. Before you purchase any cleaning product, make sure you are buying green products. Your decision will not only affect you but other people’s lives as well. You should also consider the effects on plants, land and sea animals, and other wildlife. 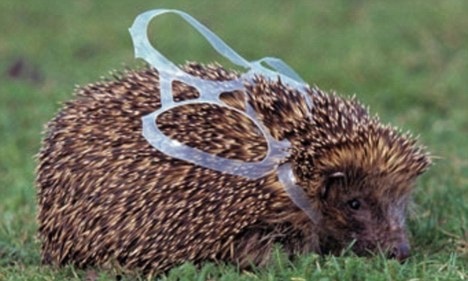 Pollution is among the primary ways in which humans have caused extreme modifications of wildlife habitat. Although atmospheric pollution may have natural sources, for example, volcanic eruptions, the expression is usually utilized to refer to the gaseous by-products of man-made processes such as energy production, waste incineration, transport, deforestation, and agriculture. There are two kinds of pollution: direct and indirect pollution. Specific statistics for indirect contamination are harder to pinpoint. Indirect pollution threatens the habitat of creatures. Destruction of the ozone warms conditions and the infringement on habitat from solid-waste facilities affect animals. Direct pollution is more easily studied. In cases like this, animals and their habitats are influenced by pollutants. The most common are acid rain, oil, metals that are toxic and chemicals. These are a few examples of wildlife contamination. Some air pollutants have caused an alteration in the supply of specific wildlife species. Air quality is essential to the health of fish and wildlife species and their habitats. The air pollution could harm these natural resources. The pesticide DDT was banned in the U.S. in 1972 because it caused raptor eggs to thin and break. But remaining DDT and other organ chlorine pesticides continue to impact wildlife. Furthermore, DDT is still used as the control of malaria-bearing mosquitoes in some other countries. Contamination of the seas due to oil spillage isn’t rare. It happens all over the world every day, fouling coastlines are killing and destroying fisheries. 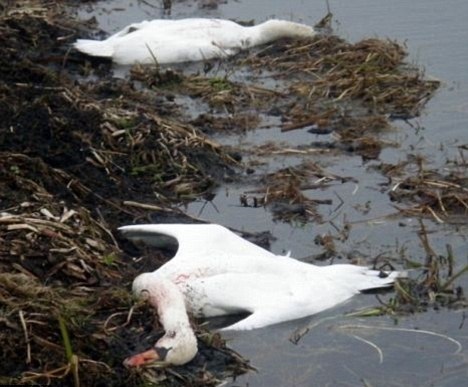 Oil spills have immediate devastating consequences — marine mammals and waterfowl coated with petroleum drown, are poisoned, or die of hypothermia. Balls can smother organisms. Obvious effects include reproductive harm and tumors in fishes and crustaceans. Oil destroys the feathers of seabirds by matting them so they cannot fly. It breaks down the water resistant and thermal insulation offered by the feathers. It permits the chilly water. The bird will use up its reserves to stay warm, but it will get water logged, be not able to feed itself, become cold and will eventually drown and die. Marine Debris is rubbish and any clutter that is abandoned or lost within our marine and coastal environment. Some examples include balloons, plastic bags, plastic bottles, plastic packaging, netting, aluminium cans, and fishing line. The animal could die and decompose, but the debris resurfaces to kill again. Plastic will break down into tiny pieces, the same size as krill. Wildlife such as fish, birds, and mammals die after ingesting it or become entangled by marine debris. Fishing line, fragments of netting and ropes can cut into their skin, leading to infections of flippers, tails or flukes and result in a slow death. Chronic noise pollution from low flying aircraft, snomobiles, motorcycles, and traffic can cause wildlife to depart habitats, lose reproductive function, and become more vulnerable to predation because of loss of hearing. Sediments eroded during construction or agricultural practices are washed into waterways, damaging fish spawning grounds and smothering bottom dwelling organisms.